I have learned the value of cleaning the image up. Nice and crisp. Size is smaller than usual due to the size of the original scan I had -- though I tried extending that flowy white material it didn't work out so well for me. Anyhow, I like the overflowing-the-screen a little look. Hmm, the space look is territory pretty well covered here, but I like how it turned out. Threw in a couple little touches that are just my style. Anyhow, hopefully this is "enough work." I like the layout, but I don't like how her head is cut off at the top... doesn't give a nice feel to it. And she seems abit blurry... enhance it so it'll be smoother. The the "shiny thing" that goes around her... give it a softer look, it seems abit too sharp. NIce bg, Belldandy looks like a guardian angel! >_< I like it! Thx for sharing it! The bg looks really good, but the character is kinda blurry. Other than that, nice wallpaper. great wallpaper and even great look. lovely bg! I always like this angel look on belldandy! 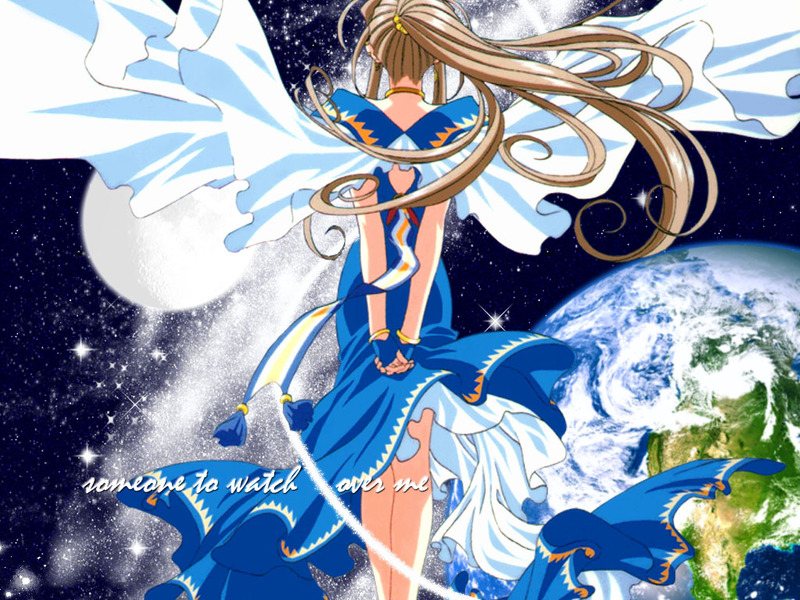 The earth, space and Belldandy's color fit so nicely! great wallpaper and even great look." Yes this a great wall paper of Ah! My goddess. I love the background and how she is looking at the world. The earth looks fantastic. Grreat job. Whew!! For some reason, looking at girl's back is always kinda cute and exciting, and this is no exception. She looks kinda hot, but cute and sad. Like some sort of romantic stage. But looking at the world gives another idea of this wallpaper. Is very cool, and the background is fine. The mix ys really good! !